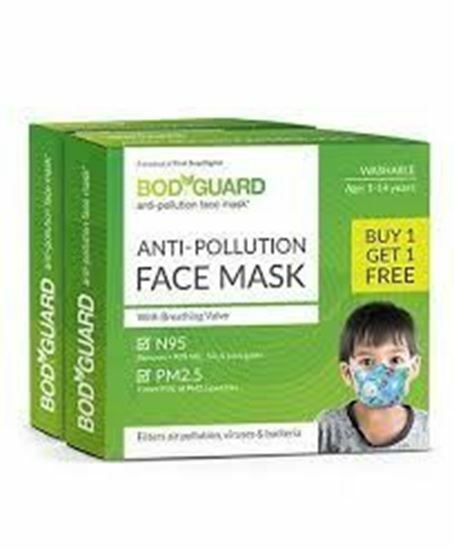 Bodyguard Anti Pollution Face Mask is made of Polyester cotton. - Designed to help provide quality, reliable respiratory protection to the children and it should be used by children above 1 year of age. - Uses a variety of features to meet the respiratory protection & comfort needs. - Provide effective protection against dust, odour, pollen, toxins & PM2.5 particles. Salient features of Bodyguard Anti Pollution Face Mask: - N95 filtration efficiency - Filters PM2.5 particles - Easy to wear - Comfortable fit - Breathing valve - Washable and reusable Indication: Air pollution Storage instructions: Store between – 200O C to +350OC Safety information: - A damaged or soiled mask should not be used. - Do not use in case of hypersensitivity reactions. - Should be used under adult supervision.